Election of officers will be conducted at the January meeting. If you have any Civil War related items such as books or videos, please bring them to the meeting for future monthly raffles. This month a small replica of a cannon and caisson and a set of CD’s by Gary Gallagher will be added to the raffle. 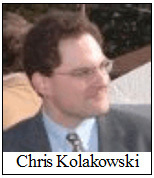 Speaker: Chris Kolakowski: Subject: Patton Foundation Museum. Mr. Kolakowski is the Director at General George Patton Museum; Past Chief Curator at National Museum of the Army Reserve, Executive Director at Perryville Enhancement Project; Policy and Transportation Coordinator at Civil War Preservation Trust. He is an experienced historian with a background in museums, battlefield tours, and preservation. Published writer on various aspects of military history 1775-present. We can look forward to an interesting and informative talk. 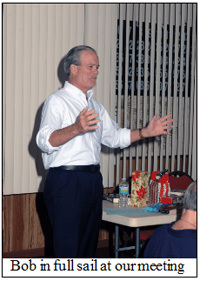 Wednesday, December 14, 2011 Program: "The Other Semmes"
An old friend, world-renowned author and lecturer, Robert Macomber, joined us for the ninth Holiday Party in a row! Bob brought us a story of the Civil War inside a family that affected Florida. One cousin, Raphael Semmes, is the famed Commander of the feared sea raider, CSS Alabama. While Raphael was a much needed naval hero to the South he was a pirate to the Northern navy and merchants on whom he preyed. He was not the only sailor named Semmes who fought in the bloodiest conflict this nation has ever known. There was another Semmes, largely unknown, who fought with the United States Navy in a backwater squadron on the tropical coasts of Florida who gained a reputation there as a very aggressive and successful ship commander. Lieutenant Alexander Alderman Semmes has passed into such obscurity that we don’t even have a photograph of him on the internet! Yet Alex’s leadership and initiative were decisive in clearing Florida’s coasts of Confederate blockade runners. We celebrate the principal figures, but we should also honor those who fought "in the trenches." Bob wrote an article on Alex for the U. S. Naval History Magazine, but as always his talk ranged far afield. Many people who have just moved here think "nothing happened" in Florida in the Civil War. Bob has spent a decade "setting the record straight." Alex was born in 1825 in Maryland. When his parents died, he was raised by his slave-owning uncle and aunt as if he and Raphael were brothers. Alex became a midshipman at age 16. He attended the United States Naval Academy and became a "passed" midshipman on in 1847. He was promoted to Master and then Lieutenant in 1855. He attained the rank of Captain in 1873, and was promoted to Commodore on March 10, 1882. In the decades before the war, the two "brothers" served around the world with distinction but without promotion. Starting under sail and transitioning to steam, they served on various vessels. Alex participated in skirmishes off the coasts of Grand Bereby, Cote d’Ivoire and, on board the USS frigate Congress in 1851, fought Russo-American Indians at Puget Sound in1856. U. S. naval officers, much more so than U. S. army officers, were educated in international politics and language. Ironically, Raphael was very successful in barring the slave trade! The Confederacy depended upon blockade runners operating out of British Nassau and Spanish Havana (each only a 1-2 day sail from the American coast) to bring in guns, coal, ammunition and cash in exchange for Southern cotton, turpentine and cattle. The coast to be defended was enormous, with innumerable rivers, bays and hidden coves. Florida’s coastline alone was over 900 miles long! The blockade extended from St. Andrew Bay (east of Pensacola) around the Gulf to the Dry Tortugas and Florida Keys and up the east coast to Cape Canaveral. The waters of the British Bahamas, Spanish Cuba and Santo Domingo and French Yucatan were included in the area of operations, making for a huge region to cover, but the Union sailors somehow did it. In fact, they did it with considerable success – by the end of the war, over 300 captured blockade runners were brought into the East Gulf Blockading Squadron’s home base at Key West for disposition. To further complicate the task for the US Navy, Spain, England and France (which had occupied Mexico while American attention was distracted) maintained squadrons to keep the US Navy from "encroaching" on their territorial waters. As the war progressed and the US Navy’s blockade of the South’s major ports increased in effectiveness, Florida’s coast provided one of the last alternatives for smaller vessels seeking to avoid US navy patrols. By 1863, even these vast stretches of barren coasts began to see increased Union naval activity. The number of vessels increased from 18 in April 1862 to 37 in March 1865. 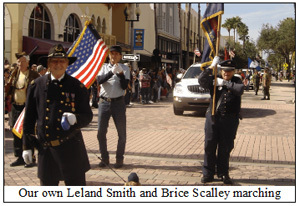 Alex served on the USS Rhode Island as a lieutenant during the first year of the war, during which time the vessel captured the Confederate schooner Aristides off Charlotte harbor. In March 1862, he was given command of the USS Wamsutta, a 270 ton steam/sail vessel with 75 men and 5 guns. For six months he scoured the coasts of South Carolina and Georgia. On April 27, 1862, while on an expedition to destroy a brig believed to be near Dorchester, Georgia, Wamsutta and Potamska engaged a company of dismounted Confederate cavalry on Woodville Island in the Riceboro River. The battle lasted 40 minutes and the Wamsutta suffered two casualties. In July 1862 Alex was finally promoted to Lieutenant Commander. On October 17, 1862, he was put in command of the USS Tahoma, a screw-driven gunboat 158 feet long, 28 feet wide, with a 10 1/2 foot draft. It had two Martin boilers that produced 400 horse power and drove the vessel at up to10 knots. It had a crew of 101 men, a rifled muzzle-loading 8" Parrot rifle (that replaced the original smooth bore 10-inch gun) and 4 other guns. This was one of 93 "90 day" gunboats built in Delaware in 1861 that had been ordered by Secretary Welles even before Congress had appropriated the money to pay for them! Since green unseasoned wood was used and the workmanship was rushed and sloppy, these ships had numerous problems. Squadron commander Admiral Theodorus Bailey sent Alex to the West coast of Florida. He seized the initiative and in the first six months of 1863 captured 7 blockade runners: The cotton-laden sloop Silas Henry at Tampa Bay on January 8th; the British schooner Margaret, en route to St. Marks, 24 miles off St. Petersburg, Florida, on February 1st; the 50-ton schooner Stonewall off Pea Creek on February 22nd; the schooner Crazy Jane, carrying a cargo of cotton and turpentine, northwest of Egmont Key on May 5th; the cotton-carrying schooner Statesman in Tampa Bay on June 6th; the British blockade-running schooner Harriet off Anclote Key (north of St. Petersburg) on June 18th; and the Mary Jane, destroyed on the same day at Clearwater, Florida. 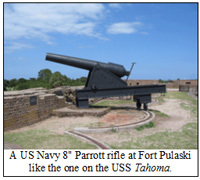 Also during this period, Tahoma engaged a Confederate shore battery at Gadsden's Point on April 2nd. Some of these triumphs deserve more attention: On May 5th, he intercepted a blockade runner that had no name and no flag. The crew all said they were British, which if believed would keep them out of the notorious Federal POW camps. In the end, Semmes identified the ship as the Crazy Jane and sent it, still loaded with turpentine and cotton, to Key West. On June 6th, under fire from a Confederate battery on shore at Gadsden’s Point (near the present day MacDill Air Force Base) men from the Tahoma boarded the Confederate schooner, Statesman, found it aground and disdaining retreat despite the heavy fire from the Rebel’s rifled gun, "kedged" (that is, dropping an anchor and then moving the ship by pulling on a rope connecting the anchor and the ship), towed and sailed it out to sea. [Note: The crews of the blockading squadrons had special financial incentives to capture blockade runners and sail them to Key West rather than sink them: they shared in the prize money when the vessel was purchased by the US and its contents were auctioned off.] To complete this small victory, the Tahoma finally silenced the Confederate field gun. Two weeks later, Semmes ran across the Harriet, which the US Navy had been looking for since 1862, when it was spied in Havana. The British captain of the Harriet was captured and told Alex that he had been using every trick in his book to avoid capture by Alex. Later the same day, the blockade runner Mary Jane was spotted, but the crew ran her ashore to escape capture. She was a total loss along with most of her cargo. What little was saved was put on the Harriet and sent to Key West. On June 24, 1863, off the Manatee River, a ship’s boat found and secured a flat boat loaded with sugar and molasses from the famous Gamble Plantation, where Confederate Secretary of War Judah P. Benjamin later hid while escaping to England via Florida and Cuba. Bob said that a visit to this restored historic site would rewarding. The flatboat was not seaworthy but Semmes kept her with his little flotilla. By August Alex was back in Key West. On August 20, 1863, Admiral Bailey put Alex in command of the James Battle, a fast blockade runner recently captured by the U. S. Navy, and sent him up to the Big Bend area, ostensibly on a routine run of provisions and stores to the blockading ships around Tampa Bay, but really to capture blockade runners on the way North and to shell rebel bases and batteries on the way home. The James Battle was outfitted with men, supplies and equipment taken from the Tahoma. In addition twelve-pounder rifled field pieces were also put aboard the James Battle. In a show of confidence in Alex’s ability, Admiral Bailey authorized him to take whatever men he needed from other U. S. Navy vessels. The James Battle had a shallow draft and could search up the winding channels where the Confederates had removed the channel markers. The hope was that the Confederate forces on shore would not have heard of the capture of the James Battle and when they sighted it would restore the channel markers. Reaching Cedar Key, Semmes added men and supplies and two small vessels. On August 27th, Alex’s little flotilla reached the Suwannee River and discovered a British steam blockade runner. Semmes’ pilot was a pro-Union Floridian supposedly familiar with the channels. However, the pilot had difficulty due to the changes in the channels since he was last there and the James Battle ran aground three times – after the third time, it lay for 12 days in sight to the Confederates. Bob, in an aside to his tale, said that secrecy and disinformation was very important to the success of Alex’s expedition. For example, Alex ordered the Union vessels to burn bituminous soft coal mined in the South instead of anthracite hard coal mined in the North, which gave off a clearly distinguishable smoke. Alex sent two armed ship’s boats to attack the mystery ship but they found it gone. By then, the Confederates apparently had been warned that the James Battle had switched sides. Not to put idle time to waste, Semmes used these 12 days to chart the mouth of the Suwannee River. On September 12th, Semmes, commanding three vessels: the James Battle, the USS Annie and the USS Two Sisters, approached Cedar Key, 60 miles north of Tampa and discovered many Confederate blockade runners protected by Confederate shore guns. On September 15th, off Bay Port, near Tarpon Springs, despite the lack of channel markers, Alex was able to approach close enough to engage the Confederate guns. He discovered an English blockade runner, but the crew burned it and the cotton warehouse, doing Alex’s job for him! By September 19th, Semmes had returned to Key West and resumed command of the Tahoma. Bailey now sent Semmes in command of Tahoma and Adela (a 7 gun gunboat) to attack Tampa and to destroy enemy ships in the Hillsborough River. In a diversionary action, Alex bombarded the town and the Confederate batteries. Alex’s pilot, Henry Crane had been a newspaper editor in Tampa before the war. In a dangerous twist of fate, Crane’s wife and children were still living there and barely survived the bombardment. While this was going on, 100 U. S. bluejackets under the command of James Henry Thompson (a pro-Union volunteer), landed at Cedar Key, 60 miles north of Tampa Bay, on October 17, 1863 and burned the steamer Scottish Chief as well as the sloop Kate Dale and captured their crews. Thompson accomplished this mission despite being so sick and feeble that he had to be carried on a litter. On the way back to the ships, 18 men were killed, wounded or captured when attacked by Confederate cavalry. For their bravery under fire, Thompson and his men were commended by both Alex and Admiral Bailey. The attack proved so successful that it shattered Confederate confidence in the safety of Tampa. In 2009, the bones of these two ships were discovered and they are being restored. By the end of his command of the Wamsutta and the Tahoma, ships under Alex’s command captured more blockade runners (350) than any other squadron and brought back to Key West 220 of them. The balance of the vessels captured were either too small or unseaworthy or had been sunk, burned or scuttled by their crews. Many, if they could float, were put to use under the U. S. flag along the coast. The war on the west coast of Florida had eerie overtones to the Vietnam war: the enemy rarely wore uniforms, or stood and fought but instead employed guerrilla tactics and could "melt" into the civilian population. For a U. S. Naval officer, a "friendly" guide might really be a double agent. In addition, the Northern sailors had to deal with diseases such as Yellow Fever, to which, unlike the Southerners, they were not "acclimated," resulting in a much higher mortality rate. How bad was it? In the summer of 1864, 30 of the 36 vessels assigned to blockade runners were out of service for lack of able bodies to man them. In February 1864, Semmes left to marry his sweetheart, Mary Dorsey of Baltimore, Maryland. In June 1864, he was put in command of the USS Lehigh, participating in the bombardment of Fort Pringle and in the operations at Charleston until that city surrendered. He cooperated with Grant's army, fought the Howlett house batteries, and was present at the fall of Richmond in 1865. While Alex was fighting his "small" but significant war, Raphael Semmes ("Old Beeswax") spent the war cruising the world in command of the CSN Alabama, destroying Union shipping, including sinking the USS Hatteras in a famous battle off Galveston on January 11, 1863. In June 1864, Raphael lost his ship to the USS Kearsage, but escaped to Richmond. In March 1865, Raphael commanded the James River squadron and after scuttling his ships, fought on land. Raphael was the only man who was both an admiral in the Confederate Navy and a Brigadier General in the Confederate army! Ironically, the two "brothers" faced each other only during the last few days of the war. In 1880, Semmes was made the third president of the Board of Inspection and Survey, which had been formed in 1868. He served as the Board's president until June 1883. 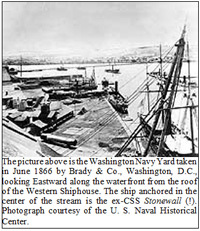 In 1883 Semmes wash given the most prestigious assignment of his career, as Commander of the Washington Navy Yard. He and Mary and their daughter lived in the Admiral’s home, which is now a wonderful museum. Since 9/11, it is harder to gain admission because of all the other "targets" there. Alex’s story now turns tragic. On June 22, 1885, he committed suicide in his office. No cause has ever been determined, but his widow, Mary, unsuccessfully petitioned the Navy Department on behalf of herself and her daughter, then 12 years old, to have his death ruled "in the line of duty because of stress and disease." Had the petition been granted, their benefits would have been greater. Mary died in 1917. In every talk, Bob explains that when he dies, he has one wish: to be able to meet and question great men of history, such as Jesus, George Washington, Abraham Lincoln, etc. He would also like to question Alex Semmes for an explanation of why he showed such aggressiveness and bravery during the war. Could part of the explanation be that his cousins, Raphael and Paul Jones Semmes were on the other side and he did not want anyone to question his loyalty to the Union? We will never know. The usual brisk Q&A followed after which we vigorously applauded Bob for another fantastic talk. 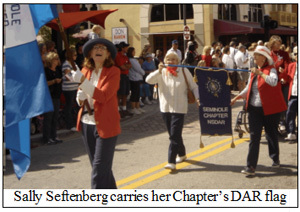 On November 11, 2011, some of our members marched in the Veteran’s Day Parade down Clematis Street, West Palm Beach, cheered by an appreciative crowd and bright skies.